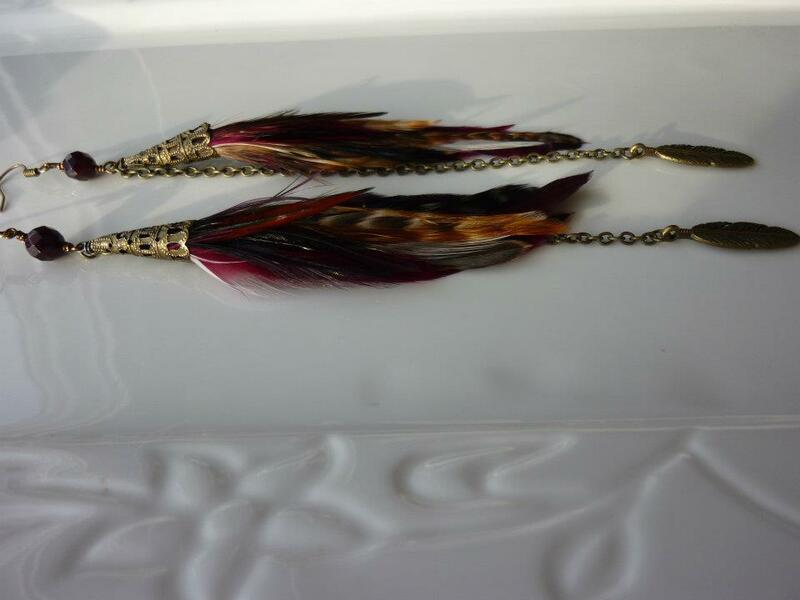 One of the biggest trends we're seeing for 2012 in Hollywood is the return of the feather earring. Some of the hottest stars and fashion icons such as Miley Cyrus, Gwyneth Paltrow, Jessica Biel, Selena Gomez, Blake Lively and Drew Barrymore have all been rocking the style on red carpets across the globe. We caught up with Canadian jewellery designer, Lorri Schlamp, from Polished Presence Design to learn more about the fad and where you can get them here in Canada. Can you tell us a bit about Polished Presence Design and what you offer? Lorri Schlamp of Polished Presence Design is a jewelry designer now based out of Edmonton, Alberta area. Polished Presence originated in Prince George, British Columbia but recently made the move to the big city to expand their business and their fan base. 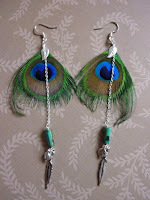 They specialize in feather jewelry and also sterling silver and gemstone creations, all handmade, and all completely one of a kind. Their jewelry is eco-friendly and sophisticated, but perfect for everyday wear. What are your personal favourite pieces in the PPD collection and why? 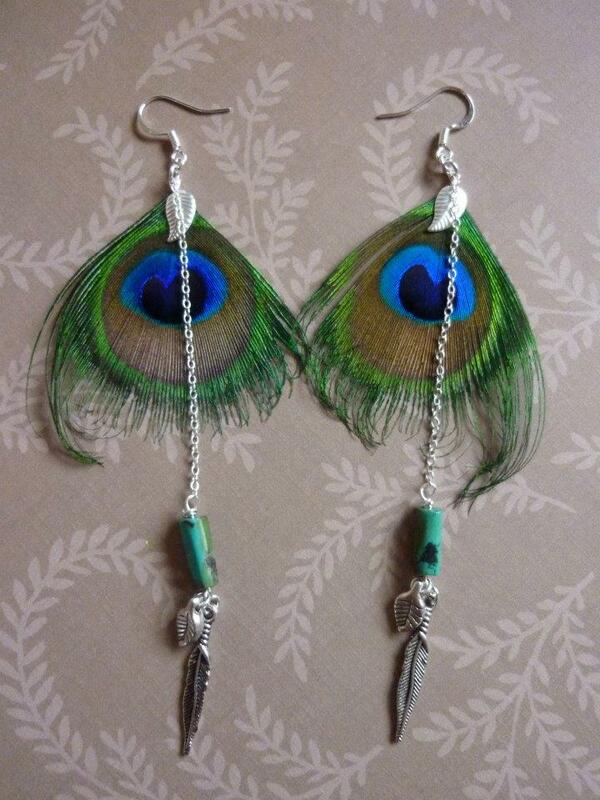 Polished Presence's personal favourite pieces from their collection are they Eyelash Peacock Feather Earrings with Sterling Silver and Turquoise drops. This particular pair was made for a fashion designer in Quebec. 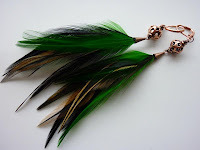 Their other most favorite pieces are the Green Feather Earrings with Copper elements, they have such a bohemian feel. When primitive man/woman first sought to make themselves attractive, they chose from their environment objects which were bright or colorful and wore them in their hair, strung them about their neck, looped them about their middle, or otherwise applied them to their person where application was possible. Polished Presence believes that feather earrings represent and symbolize many things to different people, and you can give your own meaning to a pair. From beautiful semi-precious stones (ranging from Garnet, which is January's birthstone, to Amethyst, Aquamarine,etc.) that are added onto the earrings, to gorgeous Vintaj Brass or Pantina Copper, the elements that Polished Presence adds to the pieces made make them versatile, adding colour and flair to any outfit. It is the versatility and originality that seem to keep them in demand over the years. What celebrities inspire your design taste? 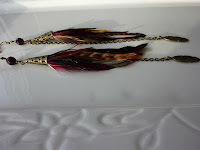 While feather jewelry has been around for a very, very long time, for me it was Steven Tyler that created the resurgence of feather accessories by wearing them in his hair on a regular basis. Polished Presence was inspired by his Hippie flair. Other celebrities that have inspired their designs is Vanessa Hudgens, who embraces the bohemian vibe. Gwyneth Paltrow pulls them off in a sophisticated but spunky way. They give a celebs a natural splash of youth. Head over to Polished Presence Design on facebook by clicking here to check out the collection or email polishedpresencedesign@hotmail.com for more information and pricing. All pieces can come customized in just about any colour and style or length imaginable.